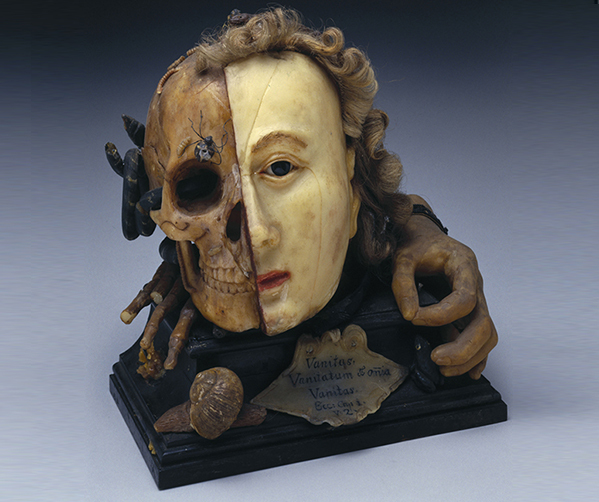 “Wax model of a Female head depicting life and death” (Unknown 1701-1800). Image courtesy The Wellcome Trust and Science Museum, London. Neuro Memento Mori is inspired by the object shown above from the Wellcome Trust Permanent Collection. It shows a woman’s bisected head, the left half apparently a detailed portrait of a living woman, open-eyed, with painted lips and blond hair arranged in ringlets. Her left hand frames her face while the right half of her head is shown in post mortem decay. Resting on her skeletonised right hand, her skull crawls with insects, maggots and worms. A snake emerges from her empty eye socket. As we look at memento mori artworks such as this compelling object, I questioned whether we ‘remember, we must die’? What parts of our brain are active when we look at these artworks, and, when we contemplate death by meditation, without looking at memento mori art?